Win $500 in FREE Groceries at Indiana State Fair | Winners Drink Milk! 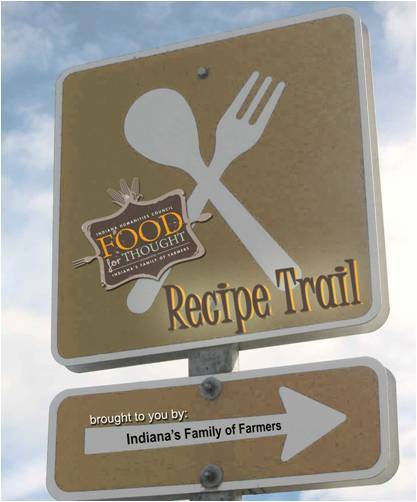 Indianapolis — Indiana State Fair attendees are invited to follow the Food for Thought Recipe Trail presented by Indiana’s Family of Famers–and win! Collect recipe cards from all eight locations on the Recipe Trail around the Fair grounds, (maps will be available), bring them to the final destination—the Food for Thought display at the FFA Pavilion and win a prize for just completing the trail (while supplies last). Then, register for the daily and grand prizes. In honor of the Year of Pigs theme at this year’s State Fair, the Recipe Trail will ham it up with daily ham giveaways. In addition, folks can register for three grand prizes of $500 in free groceries or sets of tickets to see celebrity chefs, Eric Ripert and Anthony Bourdain live at Clowes Memorial Hall on Sept. 30. Grand prizes will be awarded at the end of the State Fair. The Food for Thought recipe cards will feature a recipe highlighting Indiana’s commodities such as pork, beef, poultry and dairy along with an Indiana wine pairing. On the flip side of the cards, State Fairgoers will meet a featured Indiana farmer and read a personal food story from their family. Learn more about other Food for Thought events, recipes and additional information at FoodforThoughtIndiana.org. Indiana’s Family of Farmers was formed in 2009. Its purpose is to bring awareness to consumers on how Indiana agriculture benefits every Hoosier, every day-from the quality of their food, to the quality of their life, to ensuring a sustainable future for all of us. The participating Indiana’s Family of Farmers groups include the Indiana State Department of Agriculture, Indiana Soybean Alliance, Indiana Pork Producers, Indiana Beef Council, Milk Promotion Services of Indiana, Indiana Sheep Association, Indiana Corn Marketing Council, Indiana State Poultry Association, Indiana Horse Council, Indiana Wine Grape Council and Indiana Farm Bureau.